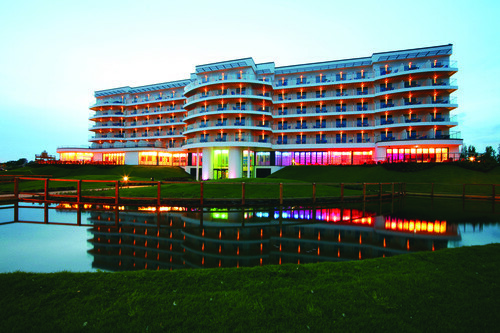 Without doubt, my favourite of our hotels is the Ocean Hotel at the Bognor Regis Butlin’s resort. Every detail has been designed to take the stress out of family breaks and give Mum and Dad a chance to enjoy their break just as much as the little ones. With a beautiful spa, great restaurant and Butler service, this hotel caters for the whole family. 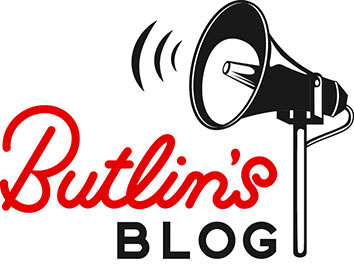 The hotel is home to the Butlin’s Butlers. These guys are dedicated to making your break stress free and to give you a helping hand. After they have taken your luggage up to your room, they will sit with you and help you build a bespoke activity plan for your family. They will get you a table in your favourite restaurants and take you on a resort tour so you know your way around. These guys know all there is to know about Butlin’s so if you have any questions, the guys in pink are your men! 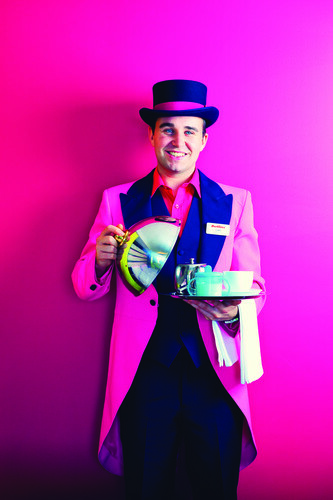 Click here to see a day in the life of our famous Butlin’s Butler, Spencer! The Ocean Spa is probably my favourite place on resort! 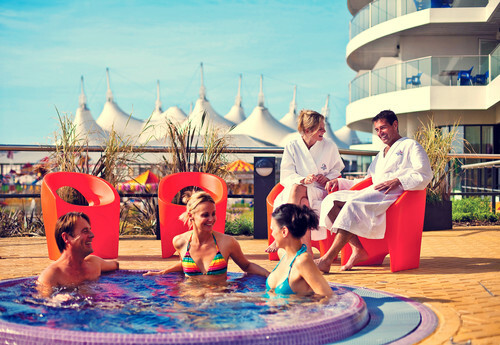 A little different to your average spa, Butlin’s have created a world of relaxation with an injection of sparkle and colour. 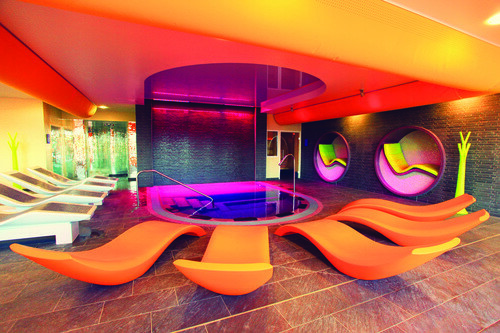 In the centre lies a colour changing Hydrospa surrounded by relaxation pods and heated loungers. The colour changes as we believe that colour plays an important role in influencing your frame of mind and well being. The spa facilities are based upon the principle of warming, heating and cooling the body to leave you feeling rejuvenated, refreshed and revitalised. So you can get all warmed up in the Sauna and Crystal Steam Room then enter the Disco Shower, where 80’s classics will have you busting some shapes under disco lights and a tropical rain shower! Then head into the Snow Cave! One of only two in the UK, the brave will head in for the ultimate chill. I highly recommend wearing the free slippers provided in the changing room lockers and having your fluffy robe hung up outside ready for you to snuggle in. Head outside to the terrace there is an Outside Hot Tub complete with views over the resort! Watch as families have fun in the fairground whilst you sink into ultimate relaxation. The spa experience doesn’t stop there. 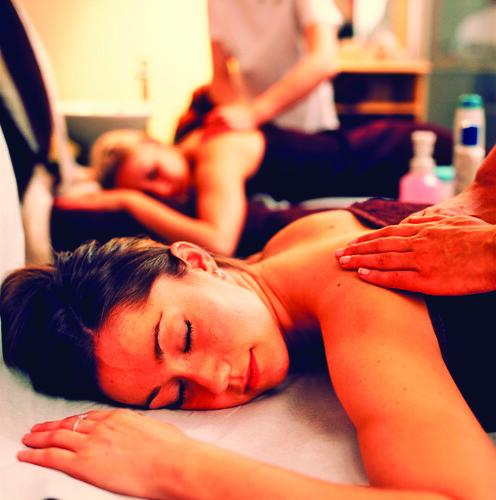 Treatments from full body massage to Black Mud Envelopment are available as well as packages for new mums and couples. Sports mad Dads can enjoy the Premier League of massages, where they are able to watch their favourite sporting highlights whilst enjoying a luxury massage and there is no need for the kids to feel left out with packages such as the Fairy Princess Make Over and the Elegant Teen Facial. Stepping out of the Ocean Spa and back into reality, The Ocean Hotel is also home to Kaleidoscope Restaurant. With an outdoor terrace that is a great little sun trap, you can enjoy great views across the resort whilst enjoying a meal. Kaleidoscope is also home to a great little cocktail bar and has a cafe, should you want to just stop for a quick coffee. 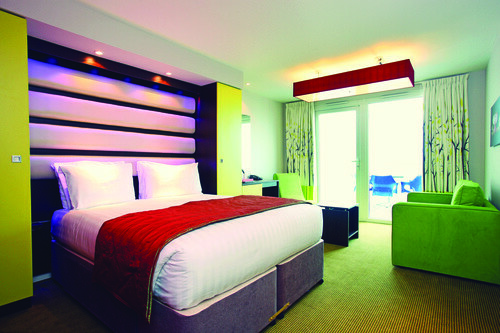 The rooms in The Ocean Hotel come with a king size bed with a colour changing light therapy head board to help you feel super relaxed. Each room comes with a flat screen TV, one in the main room and one in the kids den, alongside free WiFi and temperature control and a mini fridge. If you are located on the north side of the Ocean Hotel you will have a view over the surrounding village, Felpham and in the distance will be able to see the South Downs. If your room is on the South side, you will have a great view of the resort and a glorious view of Bognor Regis’s, Best of British, East Beach. Check out the beach today by viewing the seafront webcam here! I especially like the little touches the Ocean Hotel offers such as the ‘No Monsters Under The Bed Guarantee’. A soothing blue light has been placed under the beds in the kids den to keep them relaxed and keep those pesky under bed monsters away! See you in the Spa soon!